Alt text: "Of course, factions immediately sprang up in favor of '~*~sTaR tReK iNtO dArKnEsS~*~', 'xX_StAr TrEk InTo DaRkNess_Xx', and 'Star Trek lnto Darkness' (that's a lowercase 'L')." I guess everyone else is too deeply involved in keeping the wikipedia page as "StAr TrEk InTo DaRkNeSs" ? Wait.. I just refreshed, looks like it's been fixed. 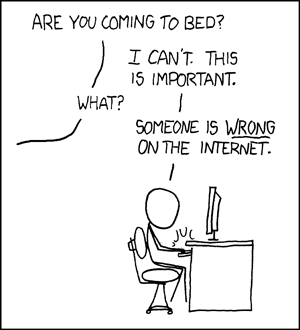 Oh wait, refreshed again, it's back again.. "Reverted 3 edits by 204.85.24.5 (talk): Xkcd vandalism". Also, I laughed out loud, really hard, when I read the last panel. Excellent setup and delivery. Last edited by ubel on Wed Jan 30, 2013 6:00 am UTC, edited 1 time in total. And now I want to stir things up with a new numbers-for-letters faction. Imagine if Randall didn't use capitals. This thread would be entertaining, to say the least. This reminds me of the fact that Wikipedia has a list of lamest edit wars. Though There is a difference between a discussion and an edit war. It looks like magnificent is spelled incorrectly in the second panel. It should be 'magnificent,' but it looks like 'magnificient' to me. Oh man, a small 'i' just looks so wrong! Maybe we should fork wikipedia? Certainly they would need to use the uppercase I to avoid the unfortunate acronym "STD", as it would seem too much like something you need to get medical treatment to cure. moz1959 wrote: Certainly they would need to use the uppercase I to avoid the unfortunate acronym "STD", as it would seem too much like something you need to get medical treatment to cure. If you find yourself talking about any move so much that you need an acronym for it, you should probably stop by LifeMart and see if there's a sale on. You might be able to find something cheap. Of course, if you're arguing about the proper capitalization of a movie, it's likely that the transplant wouldn't take. They're onto us. Or is that Their On to us? There: On To Us. My favorite part is that the official website (startrekmovie DOT com, damn you spam filter) uses the capital I form, and yet the discussion rages on. This is nothing compared to the debate about whether it should be "Mexican-American War" or "Mexican–American War". ech wrote: This is nothing compared to the debate about whether it should be "Mexican-American War" or "Mexican–American War". Did you mistype something or were those supposed to be identical? The first is a hyphen; the second is an en dash. What bothers me most about the title is that there should be a damn colon in there, unless "to star trek" is a verb or "a star trek" is a common noun, and the title is an imperative ("Star trek into darkness. Do it now! Start star trekking into the darkness!") or a complex noun phrase ("We're going to take a star trek into darkness. By the time our star trek is done, we will be completely in the darkness."). Otherwise, "Into Darkness" is a subheading and in the middle of prose (as opposed to on a poster or title card or logo or anything like that) should be written "Star Trek: Into Darkness". Pfhorrest wrote: What bothers me most about the title is that there should be a damn colon in there, unless "to star trek" is a verb or "a star trek" is a common noun, and the title is an imperative ("Star trek into darkness. Do it now! Start star trekking into the darkness!") or a complex noun phrase ("We're going to take a star trek into darkness. By the time our star trek is done, we will be completely in the darkness."). Otherwise, "Into Darkness" is a subheading and in the middle of prose (as opposed to on a poster or title card or logo or anything like that) should be written "Star Trek: Into Darkness". That was part of the discussion, it isn't actually all about the i. This is The Best viral marketing Star Trek could have hoped for! This reminds me about the misconceptions about the name of a location in Final Fantasy 9. In the game's font the uppercase i looks exactly like the lowercase L, so people have been discussing endlessly if the location is "Iifa tree" (that's iifa) or "lifa tree" (that's Lifa). I can think of no other explanation. Last edited by player_03 on Wed Jan 30, 2013 7:40 am UTC, edited 1 time in total. A wonderful way to troll that page, Mr. Munroe. sotanaht wrote: That was part of the discussion, it isn't actually all about the i.
Oh god, I hadn't actually read the talk page yet. I can't believe such a cut-and-dry issue has spawned such a huge debate, and worse still that the morons are winning despite not having a case to their side. I see bits and pieces of this point covered there but nobody has just outright said it: every single title of every single Star Trek movie and TV series has been written in graphics with "Star Trek" one one line, no punctuation, and a title-case subtitle on a separate line below, and all of them are written in Wikipedia as "Star Trek", a colon, and the subtitle in title case. And the only thing anyone on the "Star Trek into Darkness" side has to offer is that in one place, the synopsis, the title is cleverly used as part of a sentence where "Star Trek" is a proper noun and "into darkness" is a prepositional phrase attached to the verb "taking", and that in such cases MoS would have "into" lowercase. This despite the director himself stating that the movie would have a subtitle with no colon. Ridiculous. ...I should probably go post this on the actual talk page there. Pfhorrest wrote: ...I should probably go post this on the actual talk page there. In hopes of reaching 50,000 words without resolving anything? Every single one of those has a colon in their title, even though none of the film's art, posters, titles on DVDs, etc, had that same colon there. 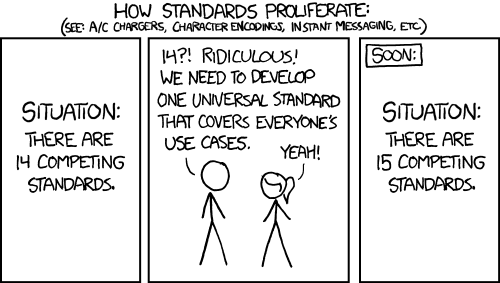 These guys have enough self-irony to start discussing how to capitalize "Xkcd" when referring to this comic. bandwevil wrote: My favorite part is that the official website (startrekmovie DOT com, damn you spam filter) uses the capital I form, and yet the discussion rages on. The "serious" Wikipedians will argue about anything. "I don't care if E. E. Cummings used all lower case with no space between the first initials - it's just wrong, so we have to do it right." Damn, I picked that out of thin air... Now looking, I see it's an actual argument. Yup, my view is "if a content creator/artist choses a certain presentation style, that is the official style." See: iPod. Actually, they decided to do away with the colons after the reboot, so the new movie titles would be graphically different from the old ones. At least that's what I heard. BTW, did you notice the discussion on the talk page shifted to arguing whether to write Xkcd when it's the first word in a sentence? I may be misinterpreting since I only skimmed the discussion, but are they really using the fact that an official source wrote "In Summer 2013, pioneering director J.J. Abrams will deliver an explosive action thriller that takes Star Trek Into Darkness." as proof that the I should be lower case? ...Not that I think there's a problem with the semantics, but what does she mean "THEY SHOULD HAVE SENT A POET" ? They who? And sent Into (sorry ) where...the forums? Ha! I thought you were joking about the hyphen/endash issue. But you weren't. And the first word of a title (or a subtitle, which Into Darkness most certainly is in this case, colon or no colon!) is capitalized even if it is an article, preposition or conjunction. Fact of the matter is, there are conflicting schools of thought regarding capitalization of titles; some say every word, some say the first word and every subsequent word except articles/prepositions/conjunctions, some say even articles/prepositions/conjunctions if they're more than six letters long, at least one British variant says only the first word and any proper names, etc. There should be a prevailing style guide that settles the matter, but apparently the Wikipediocracy hasn't bothered to establish one, so the law of the Wild West applies. Haven't actually seen any Star Trek movies, but great reference to .-=conTact=-. da Doctah wrote: Fact of the matter is, there are conflicting schools of thought regarding capitalization of titles; some say every word, some say the first word and every subsequent word except articles/prepositions/conjunctions, some say even articles/prepositions/conjunctions if they're more than six letters long, at least one British variant says only the first word and any proper names, etc. There should be a prevailing style guide that settles the matter, but apparently the Wikipediocracy hasn't bothered to establish one, so the law of the Wild West applies. Actually, that is exactly the problem. WP has a manual of style which says first word and every subsequent word but articles/prepositions/conjunctions/etc, which would only be overruled if "Into" was the first word of the subtitle (in which case, while there isn't a style guide comment on it per se, wiki-wide precedent is to use colons to stand for line breaks between titles and subtitles), which the opposition claims is not the case on the empty grounds of "there's no colon, and it's a new series so the absence of colons in every other Star Trek doesn't mean anything!" and that the synopsis makes clever use of it in a sentence talking about "taking Star Trek into darkness", but capitalizing the latter two words (that is to say, taking the Star Trek franchise to dark places). Either it's a subtitle like every other piece of Star Trek media ever, and the studio's artistic grammar license is in omitting the colon, so WP should say "Star Trek: Into Darkness"; or, it's a phrase in a sentence, in which case the studio's artistic grammar license is in omitting the verb that "into darkness" attaches to completely, and WP should say, as it does now, "Star Trek into Darkness". In any case it shouldn't be "Star Trek Into Darkness" on Wikipedia; that's either missing a colon (most likely) or capitalizing against the manual of style (implausible, as "Into Darkness" is quite obviously a subtitle). Last edited by Jeff_UK on Wed Jan 30, 2013 11:21 am UTC, edited 1 time in total. Protected within an hour of the comic being posted. Pfhorrest wrote: the synopsis makes clever use of it in a sentence talking about "taking Star Trek into darkness", but capitalizing the latter two words (that is to say, taking the Star Trek franchise to dark places). I wonder if anyone has ever mentioned a certain movie that shows the universe of Star Trek the wrath of Khan Noonien Singh?